At the time of my review of Constantine #1, I wasn’t sure if I would read issue #2 or not. Since I love magic and sorcery, I had to give it another chance. Constantine is a magician who travels the world to search for, and collect artifacts of a dark nature to keep them from falling into the wrong hands. He obtains the artifacts by whatever means necessary, including at the expense of the lives of the innocent. In this storyline, Constantine is searching for Croydon’s Compass, a powerful compass with evil potential, made by a sadist wizard. The compass was split into three pieces; needle, dial and the lens. Constantine is not the only person searching for Croydon’s Compass. However he is the only one with good intentions. We met Sargon the Sorceress in the first issue. In this issue, we meet Mister E, a blind and wicked magician. We also meet the Spectre. Constantine is also self-centered. He does not appear to be affected when a life is sacrificed at his expense. If he does, he hides it well. He also likes to tell jokes, especially just before escaping his evil captors. I find that very funny. Ray Fawkes and Jeff Lemire are the writers. I like Constantine’s narration throughout the story. We know what gets him going. We also know his fears. I especially like when he met the Spectre. We know he’s terrified, yet he found a way to get out of the situation. For now. I was even scared for a moment. By the way, this story is full of dark magic, so prepare yourself. Especially for the last page. I like the artwork, especially the cover page. But I still don’t like Sargon, the Sorceress. I don’t look her looks, but you can definitely tell that she’s evil. I do like that visual aspect of her. Renato Guedes is the artist. Marcelo Maiolo is the colorist. Juan Jose Ryp and Brett Smith are the cover artists. 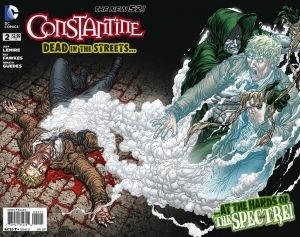 Right now, Constantine, a New 52 title by DC Comics has captured my attention. I complained in my first review of the lack of a backstory, which made the story hard for me to follow. But after reading this issue, I feel more comfortable with the story, so I intend to continue reading the series for now, to see where it’s going. I recommend this DC Comics New 52 title if you like magic and sorcery.